Summer's on the horizon, and here at Fiddlesticks we're sailing right into long sunny days and sparkling aqua waters. 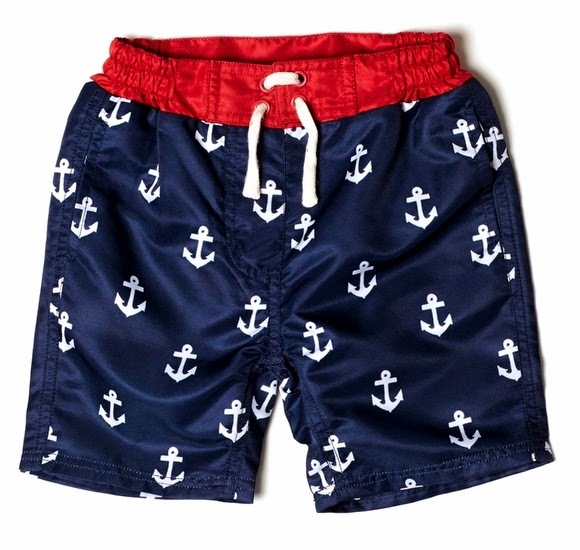 In honor of SUN and FUN, we've stocked up on loads of goodies in a nautical theme. We're carrying a big batch of swimwear this season - all hand-selected in accordance with the Fiddlesticks rules of super cute, super functional, and just a little bit different. Los Angeles-made Lilo Tati swimsuits are as sweet as the little girls who will cannonball into the pool in them: think aqua stripes, yellow ruffles, and the most darling pink and gray whale print you've ever seen. For girls who want to hit the beach in a classic nautical look, we grabbed up a few styles from Toobydoo, our go-to for everything bright and striped: look for navy and white stripes with exuberant pops of yellow (in a one-piece, a tankini, and a bikini, too). For the boys we have a table-full of board shorts in 500 fun prints (give or take), and rash guards to go on top. 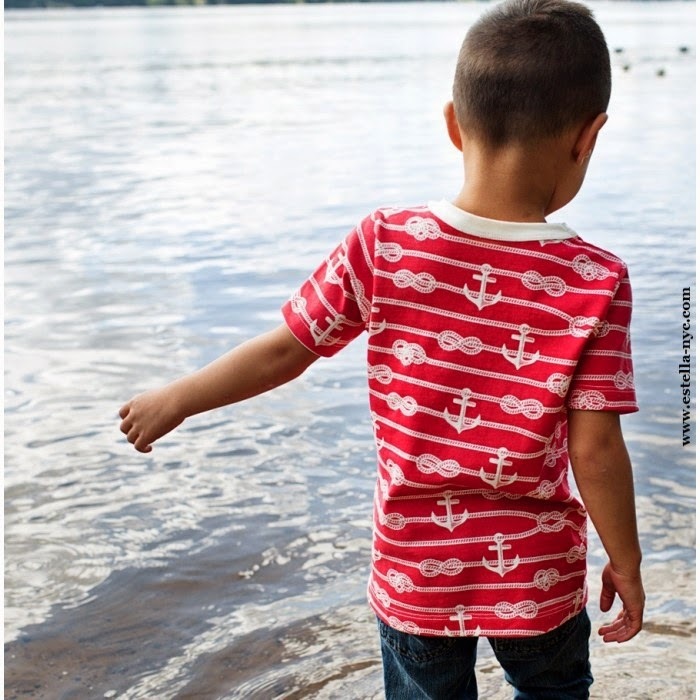 This anchor print pair from Egg Baby make us think of summer barbecues and watermelon slices, and Toobydoo's geometric aqua printed trunks are fresh and comfy; don't blame us if he insists on just one more dive (or six) before dinner. And the cherry on top of our smorgasbord of swimwear? The raddest goggles we've EVER seen. Keeping those bright eyes tear-free has hit a new lever of flashy and fun with Bling 2 O's heart shaped / sprinkle-encrusted / shiny neon menagerie of goggles. If only they came in our size! We kept the nautical theme going strong in this season's clothing buy, too. From Tea Collection's sea creature-themed graphic tees to Winter Water Factory's all-over anchor print top to Egg's classic chambray jumpsuit to Toobydoo's bold, beachy stripes, there are all sorts of ways to celebrate the sun and the surf. Did you think we forgot about the toys? Not for a second! 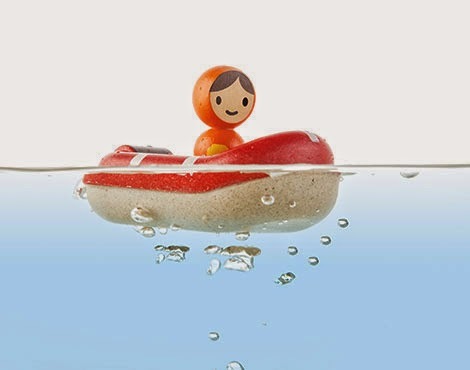 Warm up those fins with bathtub fun: we have tiny ducks that float, big friendly blue whales, and lightweight wooden boats from Plan Toys. Did they work up an appetite with all that splashing around? 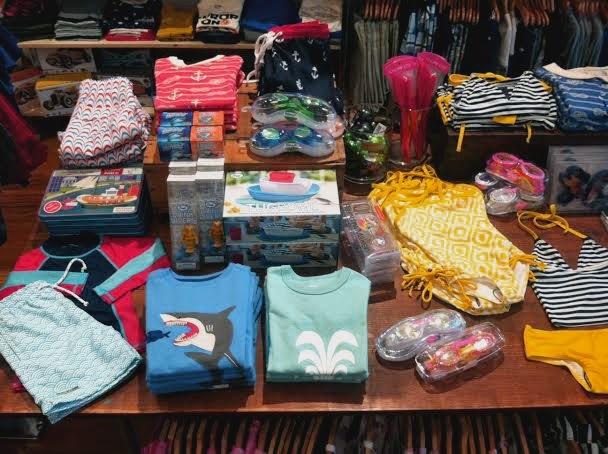 Have a sea-themed meal, complete with a just-for-kids Thomas Paul dish set and very special diver straws (trust us, they'll drink all their milk). Wishing you all a happy season of splishing and splashing around! P.S. Has the nautical bug - err, fish - bit you too? Come hang out with us on Pinterest; we have a whole nautical board going!